This online version of the Grimes Code of Ordinances is not the official version. 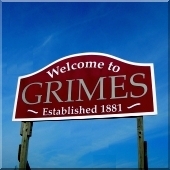 The information is provided as a public service from the City of Grimes. The only official version is available through the City Clerk's Office located at City Hall. While every effort is made to keep this information current, this online version may differ from the official version and should be relied upon for general information purposes only. These documents should not be relied upon as the definitive authority for local legislation. The official printed copy of the Grimes Code of Ordinances should be consulted prior to any action being taken.